Danaher Corporation (NYSE:DHR) and Dover Corporation (NYSE:DOV) represent polar opposites in terms of investing in the industrial sector. Danaher is a highly rated company with a history of excellent execution that growth investors expect to keep on delivering, while Dover's low rating and its recent history of poor execution make it the value investor's choice. Let's take a look at both companies' recent results and whether they make their investment propositions weaker or stronger. Whichever way you look at it, Danaher is not a cheap stock right now. No matter; investors are usually willing to pay up for quality, and Danaher certainly offers that. Long-term growth potential from the company's life sciences, diagnostics and environmental & applied solutions -- the latter offers sustainable water solutions. Good track record of growing margins. Applying the so-called Danaher Business System (DBS) to acquired companies such as Beckman Coulter and assets from Pall Corp in order to raise margin in those businesses. The relatively non-cyclical nature of the company's end markets, coupled with a high degree of revenue from recurring sources such as consumables. Despite a high valuation, Danaher stock still trades at a discount to life science and diagnostic peers such as Thermo Fisher and PerkinElmer. Of course, the one fly in the ointment has been the dental segment. As you can see in the chart below, Danaher's dental segment growth has disappointed in recent years. Data source: Danaher Corporation presentations. Chart by author. The good news is Danaher plans to spin off the segment in 2019; the bad news is the segment's core revenue actually declined by 0.5% in the third quarter, and declined 2% on a reported basis. This is problematic for Danaher, as management is obviously hoping to get a good price for the business next year. 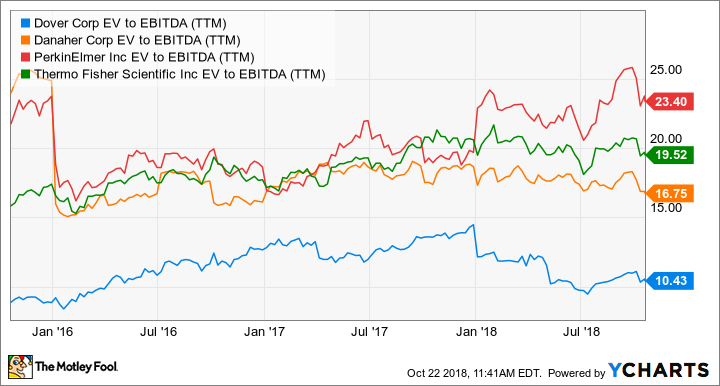 It's hard to be too critical of a company that just raised full-year 2018 non-GAAP diluted EPS guidance to $4.49-$4.52 from a previous range of $4.43-$4.50 and is generating mid-to-high-single digit organic growth in its three biggest segments, but when you are dealing with a highly rated company any kind of slip up will cause investors concern. Looking ahead, Danaher needs to demonstrate that it can get its dental business back on a good growth trajectory before the spinoff or investors could lose interest. In contrast, Dover doesn't really need to handily beat its own earnings estimates or raise guidance; the stock is arguably a good value even if it just hits its earnings and free cash flow (FCF) targets while successfully executing its restructuring plans. To put this in context, new CEO Rich Tobin expects to generate $2.5 billion-$3.5 billion in operating cash flow between 2019 and 2021. Based on expected capital expenditures of just 2%-4% of revenue, this equates to something in the range of $1.9 billion to $2.9 billion in FCF in just three years-- around 16%-24% of the company's current market cap of $12.1 billion. Frankly, even if Dover only hits the low end of its target the stock is a good value. The problem is that management has to successfully restructure the company since acknowledging that it was too optimistic about the growth outlook in its retail refrigeration (refrigeration & food equipment segment) operations. The news from Dover's third quarter is a mix of good and bad. On the positive side, Tobin raised the low end of full-year EPS guidance by $0.05 to a new range of $4.80-$4.85. Meanwhile, CFO Brad Cerepak confirmed that Dover was on track to deliver full-year cash flow in line with previous targets, and management raised organic growth guidance for its two most important segments -- engineered systems and fluids. Dover is having to restructure after overestimating end demand for retail refrigeration. Image source: Dover Corporation website. However, as you can see below, the refrigeration & food equipment segment growth guidance was lower than it was on the second quarter earnings call. In addition, Tobin noted that "Refrigeration and food equipment proved to be tougher than expected in the quarter, and we have incorporated recurring conditions into our full-year guidance." Data source: Dover Corporation. Year on year growth. To be fair, Tobin did talk of a "pushout" of machine deliveries into 2019, and expressed confidence that the business had begun to bottom. However, investors are going to have to take his word for it, because a recovery isn't apparent in the numbers now. Looking ahead, Dover needs to hit its FCF target in the fourth quarter while demonstrating that management has a handle on conditions in retail refrigeration. Which stock had a better quarter? Both companies raised guidance and reported strong quarters in their best segments and disappointing results in their weakest segments. However, given that Dover had less to prove than Danaher -- at least in order to justify its valuation -- I would argue that it was a relatively better quarter for the company. 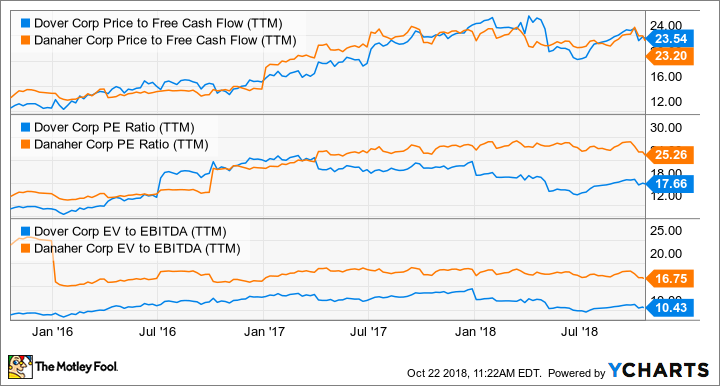 Both are perfectly investable companies, but Danaher needs blemish-free execution and probably also needs to keep beating estimates, while Dover merely needs to remain on track in order to generate significant stock price appreciation.